I have been putting off the review of California Pizza Kitchen at Forum the Shopping Mall for a while now. The pizzas are fine, really. But I don’t have any inspiration to blog about it as the photographs are quite unappetizing. This is one of the common questions I get from my readers and friends. I always struggle to come up with a suggestion since I do not fancy dining in Orchard. Yes, there are plenty of shopping malls, but almost all of them have identical restaurants and it really gets boring after some time. I’m sure most pizza lovers have heard of California Pizza Kitchen (CPK), and having been there – I think it’s a pretty good place for a nice, simple dinner in town. Since we did not have the chance to try the famous Peking Duck Pizza at Timbre, we decided to go for CPK’s Peking Duck ($20.90). Roasted duck breast, with melty mozzarella cheese on the thin crust pizza that’s scattered with crispy wontons, slivered leek, and shiitake mushrooms. Granted, the leek gave a distinct taste to the pizza, but I wished that there was less of the leek and more of the roasted duck breast. It only seemed wise to order the popular (and safe) Hawaiian Pizza ($18.90) after going for the exotic Peking Duck. It was perhaps, a little too safe. With the typical pineapple-ham-mozzarella-cheese-tomato combination, there wasn’t any room for surprises. But still, it’s a pizza that everyone enjoyed. There’s also pastas available on California Pizza Kitchen’s menu, but we gave it a miss as we wanted to try their pizzas. If you are looking for food in Orchard road, why not drop by Forum the shopping mall (beside Hilton Hotel) and check out the pizzas from California Pizza Kitchen? 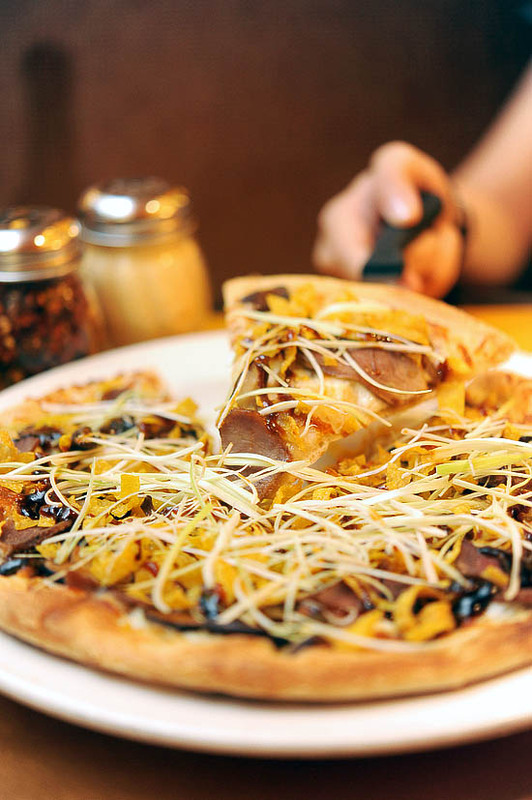 Pizza Places in Singapore that I want to go next: Peperoni Pizzeria at Greenwood Avenue, Da Paolo Pizza Bar at Chips Bee Garden and of course, Bella Pizza! I like the Avocado Rolls & the salads there! More so than the pizzas…they’re really good..
CPK in singapore is nowhere closer to the original ones in US. I ordered a Mediterranean chicken pizza and was so disappointed. A question in general. Do you get paid for writing these blogs and reviews by respective restaurants? what’s silvered leek? SLIVERED leek you mean? Went to california pizza here in the u.s. not too long ago. I seriously think that place is overrated and over priced. Seriously. Myleesa: You been to the one in the states or Singapore? I thought that the pizzas are all right, not fantastic, but pretty decent for a normal meal. Where will you recommend for good pizzas in Singapore? A friend and I dined at CPK a few months back and I ordered the spaghetti bolognese thinking that it must be a safe bet. It was terrible. The pasta was served with a very dry sauce which tasted bland and not well cooked at all. My friend’s pizza turned out mediocre too. We swore never to return. it’s a personal preference though! i’ve been there a few times and the avocado rolls + salad always win me over. Pizza’s just average unfortunately…i might just give it another go but i actually prefer Domino’s pizza as well as their Twisty Garlic sticks & Cinnamon Sticks! Thanks for a great blogsite! TERRIBLE PIZZAS at CPK. The base, toppings, how it’s cooked, ingredient quality, the price….you name it, it was ALL very bad. Please do not take this the wrong way but if you think this place is OK then I am afraid you have never eaten a half decent pizza in your life. Seriously. I am not being rude. Singapore pizzas ANYWHERE are to be avoided at all costs. I would not expect an Asian to know how to make a good pizza in the same way a Singaporean would laugh at my attempts to make a local dish! I have eaten at CPK in California 10 years ago and they were good! The only place you can get good pizza now IMHO is in the place they were invented – Sorrento in Italy. Now THAT was a pizza. Western food here with just a few exceptions is just a waste of time. We eat local food, it’s so good, fresh and well cooked why pay a small fortune for nasty pretend Western food that is processed, poor quality, frozen or just old due to being shipped in and plain bad for you??? And I am a Westerner by the way! Minxybara: Hello there, no worries all of us have different taste buds. I don’t think the pizzas here are that terrible, but for sure it definitely didn’t “wow”. hahaha yea i agree with the eating-local-food-part. But where do u satisfy your western food cravings in Singapore? Any good pizzas you tried here before? European and French stuff here is seen as very exclusive and special so people pay a premium for it even if it’s not good value for money. I get Western food cravings occasionally and I have to say British fish and chips, with tartar sauce and mushy peas is damn good. Go to District 10 bistro and bar near Newton MRT. As good as fish and chips I get back in the UK. Well done chef! They have some work to do on service, but am trying to ignore that. Almost empty one lunchtime and I STILL have to chase them round or jump up and down waving frantically for ages to get a drink or pay the bill. Why? Why? Why? Minxybara: Hello there, thanks for your reply! I have to agree that the service standard in Singapore is rather poor, and i think ultimately it is because our society does not have a rewarding system. There isn’t much pride as being a service staff, and the bulk of them are part time staff who are earning some extra bucks. Plus, unlike the Western countries, we do not have a tipping system, and the 10% service charge we paid actually goes to the restaurant and not the staff. Hi there! Fellow food blogger here. Although not quite as experienced or as handy with the camera as your self – but blogging from the heart! I AGREE wholeheartedly about the CPK pizza. A complete and utter let-down. But the PASTAS are fabulous. Have just posted about it. Must try – hummus + pita bread, chicken tequila fettuccine, spag bol, red velvet cake. I have linked to you on my site. Have a good day! I think it’s extremely unfair for you to say that pizza is crap unless it’s gotten in Naples. Obviously there are going to be some mediocre pizza in Naples, and obviously there can also be decent pizza elsewhere in the world. To spout the places you have been and such is rather petty of you. Hi, I’ve been to a tasting session for CPK a couple years back, think around mid 2009 with a few ex-colleagues of mine. We tried an appetizer, a few pizzas, one pasta, and quite a number of desserts. I’m not exactly sure why there’s so much inconsistency in terms of the food & service standard in the reviews which i read through. Even for “hungrygowhere” website, i saw quite a number of reviews with very different ratings. I do feel that their pizzas are slightly over-priced, but i will expect them to make up for it in the service department. But if real authentic pizzas are concerned, california pizza kitchen is still not the best. I’d perhaps recommend picotin pizzas instead of pizzas from the U.S. But, i will be trying CPK next wednesday with some of my colleagues. Hope i don’t get disappointed.